This weeks blast from the past came to this blog in two parts. The first part was posted on September 1, 2009. It was taken from the August/September issue of Beatlefan magazine and was written by Mark Vidals. Several months after I originally posted the story, Mark contacted me and sent me color copies of his photos. Most 18-year-olds in 1965 would have given anything to meet the Beatles. Mark Vidalis of Fairfield, CA not only met all of the Fab Four but also made his mark in history by appearing as an extra in their second movie, "Help!" At the time, Vidalis was visiting his mother in Nassau, the Bahamas, taking a vacation after graduating from high school in West Palm Beach, FL. Unknown to Vidalis, however, the attorney his mother worked for was handling legal affairs for the production company filming the Beatles movie on location there. "One day the lawyer asked me what I was doing," Vidalis explained. "I told him, "nothing" and he said, "Good, we're looking for bums." Then he told me to be at a local hotel that night, but wouldn't tell me why. 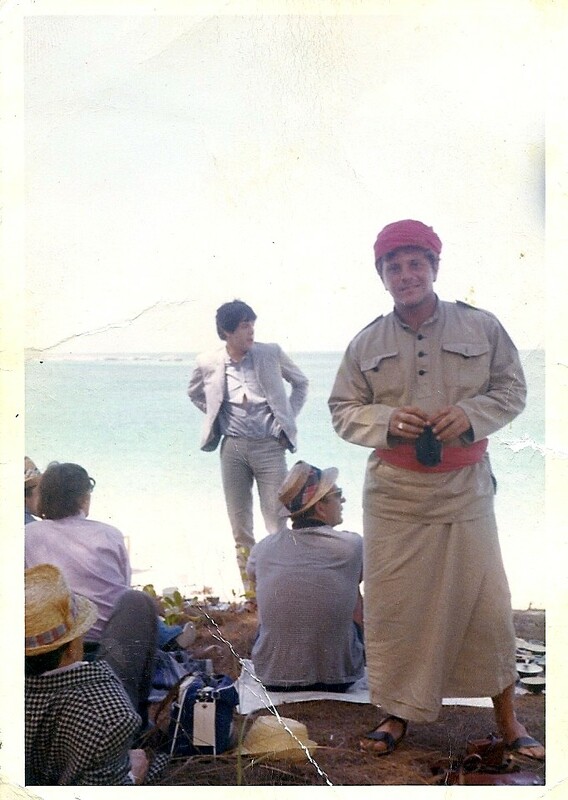 Not having much else to do and curious as well, Vidalis showed up and found himself in an interview with director Richard Lester for a $14-a day part as an extra in the movie. Lester was looking for people who weren't too tall because "They didn't want anybody in the movie so big they overshadowed the Beatles," Vidalis said. "He also asked if I'd been involved in contact sports in high school because the part included some very physical work." Vidalis qualified on both counts and got the part. The first day he was called for shooting was for a scene in the old prison camp. "The Beatles weren't even there and I was extremely disappointed," he said. The next day, though, he got a call to report to a house to be made up for the day's work. While standing on the balcony of the house talking with other extras, the four immortals from Liverpool joined them. "For a couple of minutes I was in awe," Vidalis said. "Here were guys who had people screaming and fighting to get close to them and I had a chance to shoot the breeze with them." Soon they were making small talk, however, and Vidalis's thoughts changed to "I bet nobody will believe this when I get back to Florida." Ringo Starr was the most laid-back member of the group. Vidalis recalls while George Harrison was the most "tense." Once he asked Harrison for his autograph and Harrison refused. "He was a little short-tempered that day," Vidalis said. He recalls that Paul McCartney and John Lennon were together often and were both witty and personable. Overall, he remembers, The Beatles were outgoing, fun and easy to talk to. "In between scenes we'd sit around talking as if they weren't the most famous people in the world," Vidalis said. 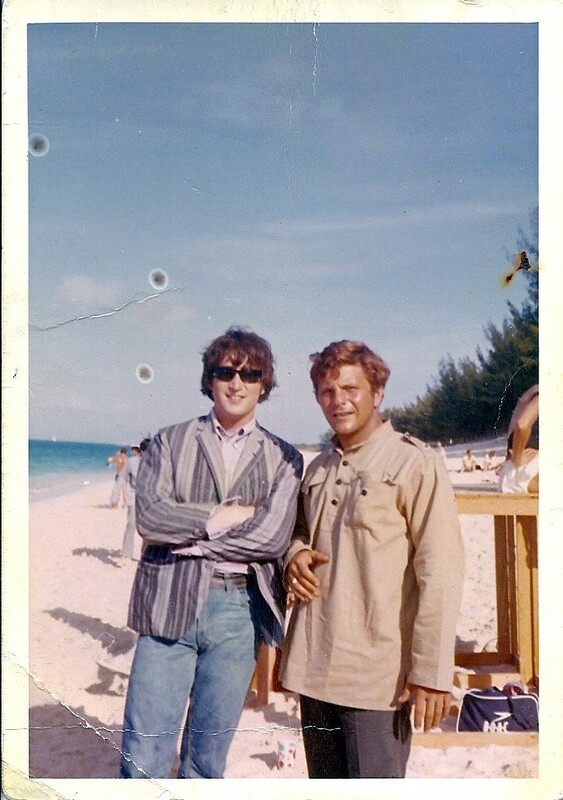 On one occasion he even worked up the nerve to ask Lennon if he could have his picture taken with him, knowing that some people would never believe him without such concrete evidence. Lennon readily agreed. In that photograph, Lennon was wearing a rumpled, striped jacket -- the same jacket he wears on the back of the "Help!" album cover. Vidalis later pilfered the jacket as a souvenir, figuring the wealthy Beatle would never miss it. He returned it when the distraught Lennon turned the Beatles' quarters upside-down hunting for it. It was Lennon's favorite jacket at the time. In the movie, Vidalis portrays one of the high priest's troops who attempts to capture Starr and retrieve the sacred ring. In one scene shot in the ocean, he was called on to put Starr underwater. After he did, Starr pulled him under and came up yelling, "I can't swim." He really couldn't either, Vidalis said. "In another scene, I had to climb up into a coconut tree and drop a coconut onto John Lennon's head, then jump out of the tree, making it look like I fell out." When he tried to make the jump, the board supporting him gave away and he really fell. "Fortunately, they only had to do the one take. I made it clear I wasn't climbing into that coconut tree again anyway." In one of the last scenes of the movie, Vidalis and the other bad guys are walking in the ankle-deep surf, having given up their pursuit of the Beatles. "There's only one extra with his face towards the camera, " Vidalis said, "That's me." By the time the two weeks of filming ended, Vidalis had decided the movie business wasn't for him. He wanted only to return to Florida and see how many people he could impress with what he had done. He was even offered a part in the James Bond movie, "Thunderball" but he turned it down because "after the Beatles, James Bond was nothing." Vidalis admits he was an even bigger Beatle fan after the movie than before. "It's something I'll never forget. The Beatles were such a big part of the life of anyone who grew up in the '60s. To have met them and even been involved in part of their recorded history makes me feel like I contributed somehow to that history." Really enjoyed reading this! One thing I found out recently is that it was cold in the Bahamas while they were filming. Ringo said that in an interview. And all these years I thought they were having a blast in the sun and beaches! Nice read. Looks like Mark passed in 2012.